A Backstays for heras and site fencing is available from Site Equip for long term or short term projects. 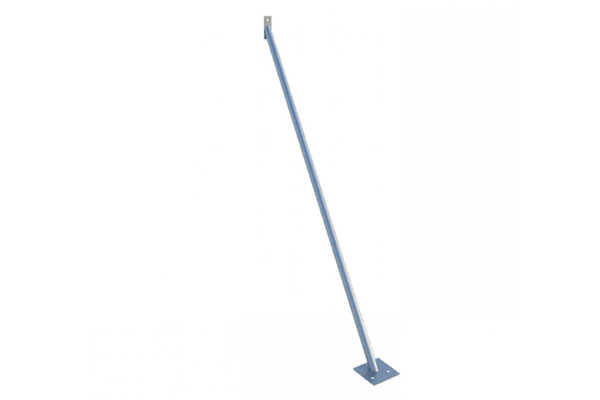 This Stabilising Support Bar is suitable for providing your site fencing with more strength to withstand large winds, uneven ground and slopes. The Backstays are positioned at an angle and are braced and bolted into the ground 988mm away from the panel using Ground Pins. The top of the Stabilising Support Bar meets the panel at a height of 1485mm; where it is secured using a Coupler between the two adjoining panels. Backstays not only offer greater stability, and security for no go areas on a building or construction sites or as perimeter fencing for an outdoor event, to ensure no unwanted visitors arrive. Our steel fencing system has been designed to minimise accidents, reduce the risk of climbing and restrict unauthorised access. Why order your backstays hire from Site Equip? Site Equip not only hire backstays but can also sell it via their sister company Site Build. We can offer ex-hire second hand equipment, stabilising blocks and security clips. All subject to availability. Site Equip can deliver and install your vehicle gate fencing hire across the South of England including; Hampshire, Surrey, Sussex, London, Berkshire, Buckinghamshire, Kent, Sussex, Oxfordshire, Wiltshire and Dorset.